What are Galleys (ARCs) & What are they good for? Galleys are primarily created by publishers for proofreading and copyediting purposes – to send to the author and editor for a final fact check and seal of approval. The content of galleys generally can’t be changed, but small details such as spelling mistakes or typos that are picked up can be. They are also used for promotional purposes and reviews – and this is their primary purpose for us self-pubbers. We want feedback in the form of blurbs, endorsements and reviews so that we can build buzz around the launch. Using galleys is a great way of doing this well in advance of publication without having to rush the cover design and typesetting process. Since reviewers and blurbers generally take a couple of months to get back to us, this is an efficient way of working. 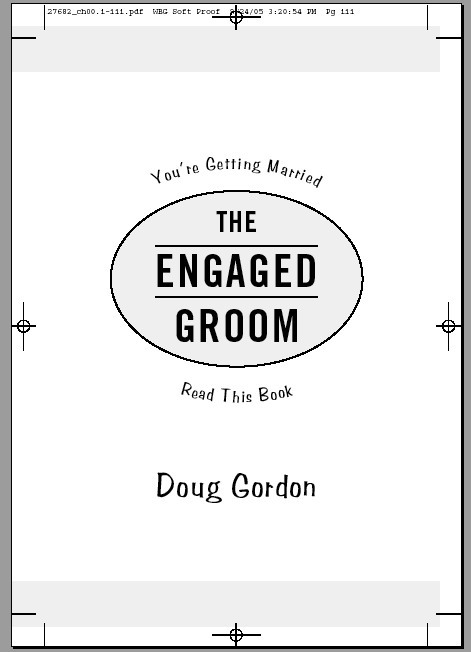 Above: Galley’s from Doug Gordon’s ‘The Engaged Groom’. 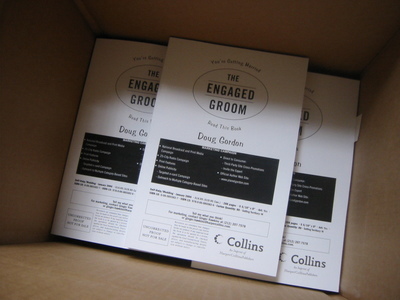 Doug was kind enough to endorse my own wedding planning book! Galleys are AKA Advance Readers Copy/ Advance Review Copy/ (ARC) as well as Advanced Uncorrected Proof, but ARC’s tend to be slightly more polished – basically a final copy with a makeshift book cover to cut down on printing costs. If you plan to make galleys then here’s what you need to know. + The cover page should state ‘Uncorrected Proof. Galley Copy Only. Do not quote without prior permission from the publisher’. + Unless the book is an illustration or photography book, illustrations should not be included, but the pages that they are going to be featured should be indicated. If the book includes illustrations, how many? Author bio including credentials and other books published. Send a cover letter with the galley. + Your galleys should look somewhat professional. They don’t need to be expensive or fancy, but a few details can help make them look more appealing. I printed mine from my computer and printer at home, and then used a nice clip and folder to “bind” it. + Send your galleys to review publications that accept self-published books. Most review sites ask to receive the galleys 3-6 months in advance of the publication date. (For a list of publications that accept self published books for review, see here). Who to send the Galleys to? + A proofreader, for fact checking and final editing. + Traditional publishers make upwards of 25 copies to send out to media folk and review publications. Self publishers will need fewer copies. (In my case I sent out 5 copies for blurbers, 4 to reviewers and 1 to the Midwest Book Review). How much will making galleys cost you? + This depends on how you go about it. I printed out my 250 page book 10 times (1 ink cartridge = $20), spent around $20 at Office Depot on clips, folders and envelopes, and then sent them out domestically at a cost of $4 each. So… making printing and sending the galleys cost roughly $80. Is printing galleys worth it? It landed me 4 blurbs from fairly well-known writers and wedding folk and 2 online reviews, though I didn’t make it into the Midwest Book Review. I have used the blurbs several times over and the online reviews sent plenty of traffic my way. So I think it was worth the cost, though if you are trying to stick to a low budget, this is a step you could skip. I would however recommend that even after your final edits, you hire a proofreader to catch any last minute mistakes. In my opinion it can mean the difference between a good book and a great book. The blog for 30 Day Books - a book studio. Grab a drink and stay a while! Laura’s class has given me the tools and the confidence to sell what I am certain will be great numbers of books. She is an outstanding teacher (I should mention that I taught college English for 25 years, and that I was publisher of a small press for about eight years). - Frederic A. Henney, B.S., M.A., Ed.D. Create Your Own Author Website!